Please join me every Wednesday through the Spring and Summer months for a Garden Tour Linky Party that I like to call Wednesday's Garden. I'd love to see all of your garden themed blog posts! For Easter, Joe cooked us a very large spiral ham. I don't remember the weight, but I do know it was too large for just the three of us...actually, just the two of us, since Grace doesn't eat ham. After dinner was done, we were left with a lot of leftovers, which was totally fine with me! The two nights following Easter, we had a repeat of Easter dinner: Spiral Ham served with asparagus and twice baked potatoes. Mm! Another night, I prepared breakfast for dinner: Ham, potatoes, asparagus and eggs all in one skillet. It wasn't pretty so I didn't get a photo, but it sure was tasty! Even with those meals, plus Joe grabbing a ham sandwich here and there, we still had enough ham leftover to make another meal. So I decided to make a ham pot pie...or rather, a pot pie filling since I started dinner a bit too late. Instead, Joe ladled his filling over some canned biscuits while I preferred to just dip my biscuits into my bowl. Either way, the meal was a success and I can't wait to make it again! For this dish, I used my usual go-to pot pie recipe, used ham for the meat and added some frozen broccoli. So delicious! In a large sauce pan, cook potatoes in water until tender. While potatoes are cooking, add 4 Tbs water to a skillet with the celery, onion and carrots. Cook, while stirring often until veggies are tender. Add additional water if needed. To the skillet of vegetables, add the butter. Heat until melted. Stir in flour, milk and broth. Cook until thick and bubbly, stirring constantly. Drain potatoes, then add the potatoes, broccoli and ham to the sauce. Cook for an additional 5-10 minutes until completely heated through. At this point, you can transfer this to an oven-safe casserole dish and top with your favorite pot pie crust, then bake in a preheated 400 degree oven for 20-30 minutes until crust is golden brown. OR, you can make things easy for yourself and just serve over toast points or with biscuits. It is so good to see you here today. 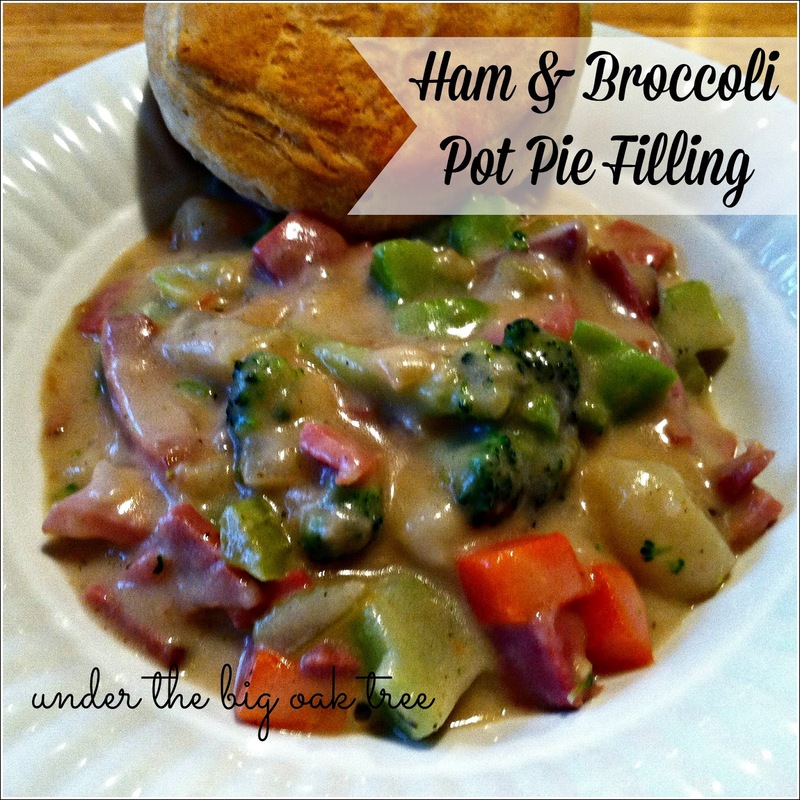 I just love your Ham Broccoli Pot Pie Filling, it looks delicious! Thanks so much for sharing your awesome post with Full Plate Thursday and hope you have a great week!